After Supper Club this past weekend, I found myself with a pound-and-a-half of leftover steamed lobster tail…oh I suppose there could be worse tragedies. Of course there was not a chance the lobster was going to go to waste. 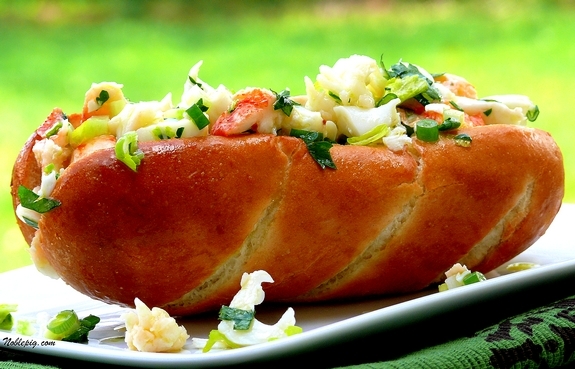 I definitely had lobster roll on the brain and went poking around some old recipes. While the lobster roll is a beloved dish of the East Coast and normally made with a generous amount of mayonnaise, this recipe definitely pushes the traditional envelope. Completely retooling this classic summertime fare is a bold move, but one done wisely, as the vinaigrette doesn’t mask the clean, sweet flavor and beautiful red color of the lobster. However, another standout was the bun brushed with garlic butter and then toasted to a crunchy consistency….brilliant. 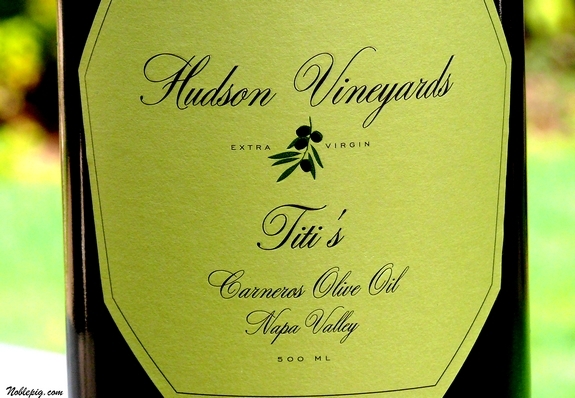 Last week, Hudson Vineyards sent me some of their home-grown extra-virgin olive oil, lovingly named after Lee Hudson’s late mother, Titi. What a gift to receive on my doorstep. Beautifully bottled and sourced from a handful of older Mission trees on their ranch, not to mention a blend of Tuscan olive varieties as well, this olive oil is a bright shade of green with rich nutty flavors and a black pepper finish. 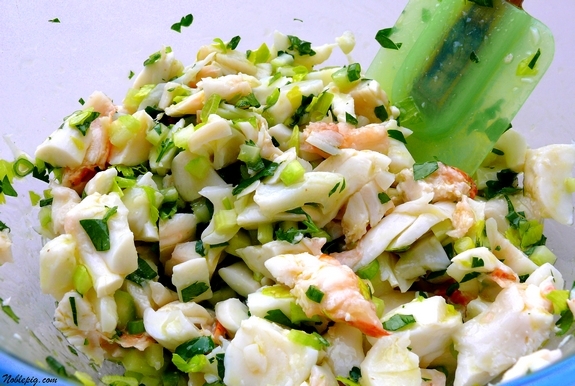 I knew this recipe would showcase the oil’s flavor and nuances, working together with the lemon to brighten the celery, parsley and scallions. It was truly a match. If you are looking for a special oil to use in salads or low temperature cooking, this really is a special offering and would also be a wonderful gift. 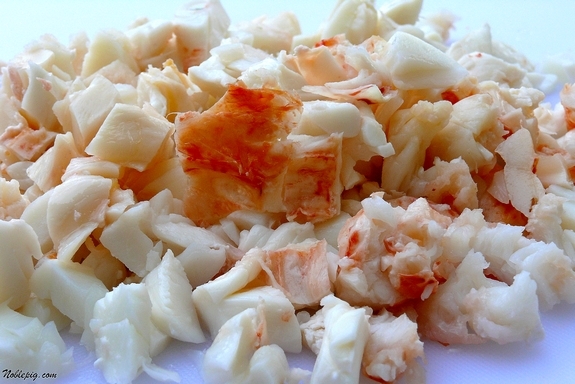 Chop cooked lobster meat into chunks. Whisk together lemon juice, oil and 1/2 teaspoon salt in a large bowl. 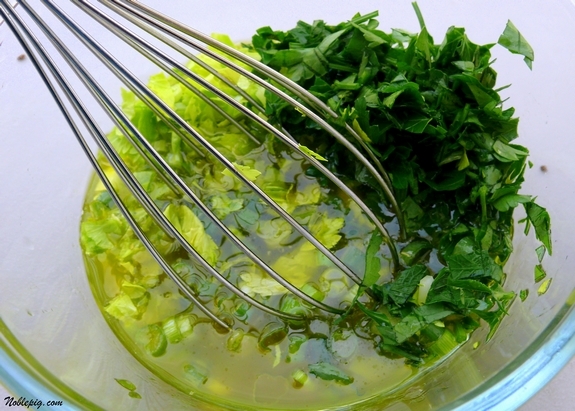 Whisk in scallions, celery, celery leaves and parsley. Then add lobster and gently toss. Season with salt to taste. Melt butter with garlic in a small saucepan over low heat, mashing garlic with a spoon. 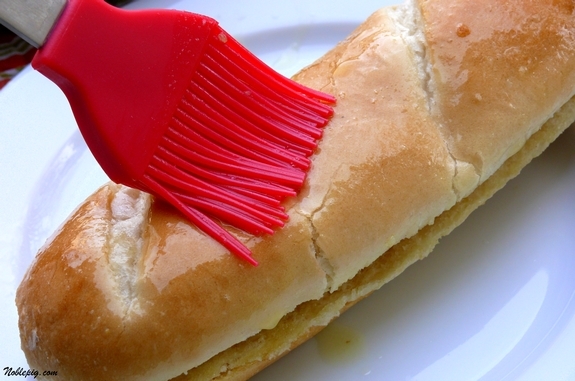 Brush inside and outside of buns with garlic butter. Toast buns in a 350 degree oven for 5 to 7 minutes or until golden. Fill toasted buns with lobster and serve. It was honestly one of the best leftover meals I’ve had. Whisk together lemon juice, oil and 1/2 teaspoon salt in a large bowl. Whisk in scallions, celery, celery leaves and parsley. Then add lobster and gently toss. Season with salt to taste. That is a beautiful thing! The garlic butter on the bun is almost distracting me from the incredible filling in it. You know you’re making me invest in lobster. I mean, times are tough. Just saying….this is absoluely exqusite – you raised lobster rolls to a whole new level. Oh. My. Gawd. This is something I’m definitely going to surprise Mr. Snoots with. Actually, if I can make it look like yours, then we’ll both be surprised! I can honestly say I’ve never found myself with leftover lobster. I’ve never even found myself with lobster in my house…ever. Oh my gosh, I’ve never been a fan of lobster rolls because to me the mayo hides the sweetness of the meat. But THIS! THIS I can totally get behind. Mmmm I may have to make some herbed buns to go along with it. Awesome!! living on cape cod i get so sick of lobster, but cath i have to say that this looks DIVINE! in all my years of a lobster lover..I have never had a lobster roll! Things need to be a changing! Man! How great is it to be sent quality products to try and critique! If anyone could do it fairly and in a talented way it’s you! Your lobster roll looks delicious. Living on the East Coast for the last 31 years, I can count on 1 hand the # of times I’ve eaten one. And I do love a good one. What’s up with that???? Please overnight me the leftovers. I need a big bite of that asap! this looks absolutely incredible!! i love lobster rolls but i always regret the mayo. i love this. I don’t like lobster *gasp! *, but this looks fabulous!! You can hardly call that a leftover meal…it looks far better than the best lobster rolls I’ve ever seen. Summer on a plate!!! hmmm, I wish I have some leftover lobster too. What a fantastic idea Cathy! That looks gorgeous. The roll itself look de-lish. I’ve tried to like certain seafood and I think it’s more the texture that I don’t like, but maybe I’ve just never had a really good bite of lobster/crab (which are the two I like the least). What I would like to know first of all is how you ever came by ‘leftover’ lobster? Second, that is certainly a delicious way to rid yourself of it. Great put together. Oh how I wish I liked lobster because this is simply beautiful! Yes, leftover lobster seems a bit ridiculous but it just happened that the tails I bought were so large, even with eight adults and two lobster courses, it was too much. However, I would not think twice about buying a couple tails and steaming them to make this again, it was that good. Holy wow. My husband would divorce me and marry you if he saw that. Sounds heavenly. I bet it smells pretty good too! Lobster rolls are a mainstay of summer here in New England. Looking at your photo, I really believe that summer can’t be far away! What I said yesterday about flying out there….after seeing this, I’m booking the flight! YUMMY! Beautiful! I don’t think one is enough for me! Wow, this looks amazing. And I think LAST YEAR’S post about the tomato soup and croÃ»tons looks awesome too! Nice variation on lobster rolls. My husband likes lobster, but doesn’t like the work involved, so he only eats it when someone else has taken it out of the shell for him. 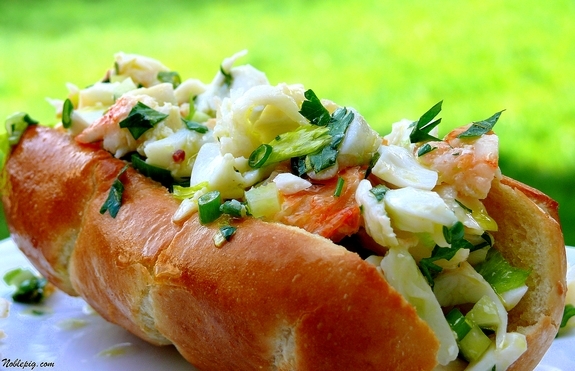 I fooled around with a lobster roll recipe for him a bit last year, adding tarragon to the mix. I think he’d like your version better since he doesn’t like mayo. Wow – looks fabulous! What a hardship having leftover lobster LOL. It’s not something we’d have the luxury of in this house cause we’d eat it till we bust. Cathy, I just enjoyed reading your post “Familiarity Breeds Contentment” from two years’ ago and had to comment again. Such a beautiful post and the boys – awww! It is wonderful to think that in time, someone will be writing about your wine and your vineyard too and remembering in much the same way! Your attention to detail makes this truly gorgeous. The flavors sound fantastic and that olive oil must stunning. I love your lighter version of a lobster roll. I’ve never been a fan of adding gops of mayo to lobster, which is already a perfect food all on its own. Glad you had such a yummy lunch! yes please, i have been craving a lobster roll all winter long. This looks, unbelievably, die and gone to heaven good. The flavor must be wonderful. Theres a place called Old Port Lobster Shack in Redwood City that I love because of their Lobster Rolls. Now I have a craving. I made these from Gourmet too! They were so fresh and wonderful. Thanks for the reminder of them! I wish I was your neighbor then I could help you eat all of your leftover lobster. Remind me again: what are leftovers? I’d love to have lobster tails, leftover or otherwise, magically appear in my fridge! Oh that does look so delicious! Wish I had one of those rolls right now! I do believe a good olive oil makes all the difference and this one looks lovely! Fabulous! There’s nothing better than a yummy lobster roll! Lobster is my most favorite food group! I grew up eating lobster rolls in the northeast always the traditional way but got tired of all that mayo as I got older so I can really appreciate how wonderful this version must be. I would take this intravenously! That lobster roll looks sooo good. Wow! This is great, I may use this as a main dish for a summer party! Yes that good!